There is a wide choice of paving to choose from when deciding on the type of paving to use for your patio. Paving is made from various different types of materials and come in various shapes and sizes. These paving slabs are readily available in large quantities at most builders merchants. Usually they are available as 450mm or 600mm square, while their thickness range from 20 to 30mm, and can be picked up from as little as £5/m² up to £15/m². While the profile and colour (they are usually pastel greys, yellows or pinks) of these slabs won’t fool anyone that they are real stone, they do provide an inexpensive option for paving a patio. More expensive paving slabs aim to reproduce the texture and weathered appearance of reclaimed natural stone which can otherwise only be achieved following decades of exposure to the elements. This weathered appearance is just what is needed to maintain the charm and character of a period property. A good example of quality natural stone replica paving would be the Olde York range from Stonecrete. An alternative is the Bradstone Old Town range of paving which replicates the naturally weathered York flagstones as found in the streets of London and numerous other cities and towns in the UK. Many quality replica paving slabs come in kits of mixed sizes which means that the finished area mimics the random effect obtained over a century ago when natural flagstones were hand cut and the size of each slab varied depending upon the size of the material available. Contemporary paving provide clean, sharp lines and angles combined with bold, consistent colouring to provide a modern, cutting edge and somewhat fashionable design which is perfect for minimalist, contemporary surroundings. Manufacturers of Contemporary paving usually aim to offer improved functionality, such as the slabs being easy to clean. 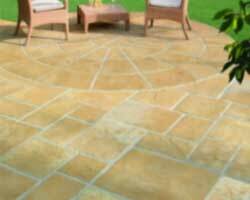 Natural Sandstone paving has become increasingly readily available over recent years, largely coming from Indian quarries. Its natural colour variations and profile makes for an interesting patio which can work well in period or modern surroundings. This, together with the fact that it is surprisingly inexpensive, makes Natural Sandstone Paving a very popular choice for a wide range of uses. It is available in a range of colours and can be bought roughly hand cut (to keep its natural appearance) or sawn (which gives a smooth, flat surface for a more modern look). 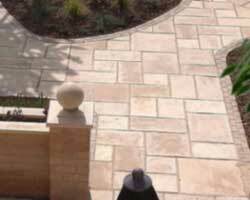 Stonecrete offer a range of quality Natural Sandstone Paving which is very competitively priced. Cost will generally have some effect on choosing the materials used for any home improvement project. However, whether you have a small or large budget, it’s worth thinking about what the difference in price between the paving options will mean to you and your surroundings. The difference between a good looking or a rather disappointing patio may be just a few pounds per square metre, but is any cost saving really worth it ? Remember, paving will last for years, and if you want to change it, it will involve additional costs. A further point to consider is that there is more to a patio than just the paving slabs. It is actually possible to make a more attractive patio using cheaper paving slabs wisely than by using more expensive slabs with little thought to the overall design. Using a number of paved levels, including paved shapes, adding plants or accessories will usually draw the attention away from the actual paving slabs and improve the look of even the cheapest slabs. The choice of slab and the design of your patio needs to be in keeping with the character of your house and garden. Creating an area of paving which, once finished, does not fit in with the surroundings will lead to disappointment and probably you will feel that you have wasted both time and money. If an ultra-modern, shiny area of paving were attached to a quaint country cottage, it would not only look out of place but would tend to highlight any small imperfections of the house. Before deciding on the type of paving, consider what the patio will primarily be used for. Smooth paving can be slippery when wet and will become even worse if surface mould accumulates. Riven slabs are less likely to become slippery but their uneven surface may cause any table and chairs to wobble. Also, consider how much weight you need the paving to support; all are designed to allow pedestrian traffic but only the very thickest of paving slabs on a very firm sub-base will suit vehicular use. Certain types of paving slabs need more time to lay than others, so if you are paying someone to lay your patio, they will charge more. Budget paving slabs should be quicker to lay as each slab is identical in shape, profile and thickness and can often just be laid on a bed of compacted sand using dry sand brushed into the joints. High end replica slabs and natural sandstone are full of character but will probably need more time to lay as the spaces between slabs will vary and the art is in arranging the slabs so that the joints don’t vary too much. Because of their varying thicknesses and their tapered edges, they will probably need a full bed of concrete and mortar joints in excess of 100mm. However, the end result will probably be worth the time and effort. When laying a random effect or mixed size patio kit, extra time will be required to plan the layout before actually starting to lay the slabs.